Investigate the disappearances of newcomers to Summerset. "I'll deal with the pearl, you hold off these creatures!" Meet with Razum-dar outside Shimmerene. Find and talk to the people Razum-dar suggested. Speak to Valsirenn and continue the investigation. Attend Kinlady Avinisse's garden party to gather more information. Find and search the Coral Forest. Deal with Aldarch Tilcalar and speak to Valsirenn afterward. Travel to Artaeum and talk to Ritemaster Iachesis. "Are ... are those creatures ... newcomers? They're hideous!" The quest can be started in three different ways. The first way is to activate the quest through the Stories Collection menu and then take a boat trip to Summerset. 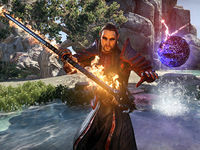 The second way, is to speak with Calibar who can be encountered after leaving the Eldbur Sanctuary near Shimmerene while he is fleeing from something, or when arriving via the Shimmerene wayshrine. Calibar: "Let the cat fight those monsters! I'm getting out of here!" Calibar: "The island’s sprung a leak! Run!" He can then be spoken with to find out what is wrong. "First the Queen issues a decree that changes the status of Summerset from an isolated paradise into a … a tourist attraction! Now monsters! Sea creatures! I’ve never seen anything like them! Well, I say let the cat fight them! Better him than me!" Monsters? Cat? Slow down and tell me what happened. "Suddenly the ground opened, spewing water and strange creatures! They attacked us! Luckily, one of the newcomers, a Khajiit, leaped in and drove them back. Called himself Razum-dar. He could probably use some help, if you’re so inclined." I’ll go talk to Razum-dar. The third way to start to the quest is to speak with Razum-dar himself, who can be found on the path between Shimmerene and the Eldbur Sanctuary. If you arrive fast enough you can watch him quickly dispatching the aforementioned monsters, then destroying a strange pearl nearby that seems to radiate dark magic. He has slightly different dialogue if you've already helped him during the Aldmeri Dominion questline. "Have you ever seen such creatures? Raz has not. Probably neither have you. You are a newcomer, yes? New to this island of High Elves? This one has an eye for such things. And you look capable. So, can Raz interest you in some cloak-and-dagger work?" "Ominous? No, nothing of the sort. Well, maybe a little of the sort. Depends on how things develop. Raz has come to Summerset at the behest of Queen Ayrenn. To make sure her decree regarding the opening of the island proceeds as she directed." "Ask some questions. Determine the mood in Shimmerene and see how the newcomers are faring. Rumors have reached the Queen and she is concerned. So Razum-dar comes to see what’s happening and fights strange creatures. Now Raz is concerned as well." I’ll ask some questions around the city. While you ask questions around the city, Raz can take care of some other business. It may or may not involve scratching and clawing. Let’s meet near the entrance to Shimmerene when you have something to report." Regardless of how you started the quest, you will be investigating this matter for Razum-dar. Your job is to interview three citizens near Shimmerene: the Altmer Olnewil, the Argonian Tsolxoza, and the Redguard Rhanul. Head into the city and the surrounding area to find and speak with these people. "Not that you’d understand the concept, but the Path to Alaxon requires dedication and complete concentration. I must find the perfect shells or my pigments will be substandard. And do you know what that will do to my art? What’s the Path to Alaxon? "An Altmer concept practiced widely here in Summerset. Alaxon is the state of perfection that every High Elf strives for. The Path to Alaxon represents the approach we take to achieve that state. Now, why have you interrupted my work?" I heard you made complaints in Shimmerene. I’d like to hear about that. "I believe in caution as much as the next High Elf, but sometimes the rules get in the way of common sense. My apprentice lived here for more than a year. Good help is so hard to find, especially among the newcomers, and she was adept at making dyes." What happened to your apprentice? "They took her away! Said the had to scrutinize her qualifications, test her knowledge of culture and etiquette. But I haven’t seen her since! My work suffers, so of course I complained to the monks. Now I Have to gather my own shells!" Did the monks offer any explanation as to where she was or when she’d be returned? "They told me I could fill out some forms and appeal to the Kinlady, but who has time for such bureaucracy? And for a Wood Elf? I’ve said too much. I have work to do and all this aggravation has diverted my Path to Alaxon." I’ll let you get back to your work. After the encounter, you hear her say, "Perfection requires constant vigilance, so back to it!" Now you should find the next person on the list - Tsoxolza. Tsoxolza is the second-closest target to where you started your investigation. Unfortunately, instead of Tsoxolza, you find only her backpack and a letter to someone named Jeemaht. Her body is beside a river just west of the main entrance to Shimmerene, guarded by a Salamander. Perhaps the letter can serve as a clue to what's going on here. The last person on the list, Rhanul, is located at Shimmerene's docks in a warehouse. Speak with him. "A newcomer? In the warehouse district? Unusual, but how can I help you today, my friend?" I was wondering how your name ended up in the Divine Prosecution's observation log. "The Divine... who told you that? If a justiciar sent you to try and trick me into confessing—no, no. The High Elves would never send a newcomer to perform such a task. But I admit it. I made my thoughts known." "The Divine... Did a justiciar send you to harass me? I've lived in Summerset my whole life and I did nothing wrong! You High Elves! You say we're welcome and then you treat us like criminals! Is there any wonder I had to speak out?" And what were those thoughts, if you don't mind me asking? "I arranged to bring my cousin here to work with me. The ship arrived, but all the newcomers were carted away. For questioning, they said. I complained to the Kinlady and anyone else who would listen. And what has it gotten me? Nothing!" You're not a High Elf. Have you lived in Summerset very long? "Oh, my family has been here for generations and generations. Before the Queen's decree, outsiders might have been rare, but we were not unheard of. Our business has grown and gets better every day. That's why I sent for my cousin. We need the help." Do you like living in Summerset? "Summerset is a rare and beautiful jewel in the Abecean Sea. I love it here! The High Elves treat us like children, but they have never been hostile. The Queen's decree has stirred the waters, though. I fear it will get worse before it gets better." After you have finished interviewing him, he will dismiss you. Rhanul: "I really must get back to work now. Every moment that my cousin remains sequestered is another moment where I must perform the work of two people. Pleasant travels, wayfarer." Now that you've interviewed everyone, find Razum-dar near the entrance to Shimmerene and tell him of your findings. When you find him, you'll witness some angry citizens and Aldarch Tilcalar Making a fuss about the newcomers. Corimin: "Send the newcomers back where they came from ! We don't want them here!" The artist's assistant and the Redguard's cousin have both been sequestered. "Sequestered, hmm? Just a different word for imprisoned, yes? Rhanul's cousin just arrived, but Olnewil's assistant has lived on Summerset since long before the Queen ever issued her decree. What about the lizard? What did Tsoxolza have to say?" Tsoxolza was dead by the time I reached him. I found this letter in his pack. "Why would the Aldarch gather up newcomers and non-High Elf residents alike and send them to the monastery? Does the Kinlady condone this behavior? Raz's head itches, and not in a good way. Our course is clear, five-claw. We must go to the monastery!" All right, I'll help you investigate the monastery. "Raz admires your enthusiasm, but this one needs you to enter the monastery on your own. Raz has other fish to catch. This one will help you get past the sentry, though. When you notice that the sentry is distracted, just slip quietly inside." Wait for Razum-dar to distract the guard, then slip inside. Raz: "Sentry! Raz owes you for that game of cards and has come to pay!" Monastery Sentry: "Huh? I don't recall any... you say I won some gold?" Raz: "Don't you remember? Raz always pays his debts. And he always buys the drinks!" "A curious pearl. I wonder where the Aldarch acquired it?" Once inside the monastery, begin your investigation. There's a monk sleeping on a bench on the first floor you can question, but the real prize is upstairs, within Aldalrch Tilcalar's office. Near his desk is a strange pearl, like the one Raz mentioned earlier. Suddenly, you hear a voice behind you; you're not alone. Valsirenn: "Unusual knick-knack for an Aldarch's office, wouldn't you agree?" Speak with Valsirenn. Maybe she knows something helpful to your investigation. And what purpose would that be? "The sequestered newcomers. I came to find out what happened to a friend. I assume that's what brought you here as well?" "A house of worship shouldn't be used as an internment camp. And it shouldn't be locked to the public, either." I saw a pearl like that. There were strange creatures nearby. "Interesting. I've never seen anything quite like it. I find it intriguing and a bit disturbing." "But we aren't here to discuss curios—strange creatures notwithstanding. We need to find out what's happening with the missing newcomers." How did you happen to get past the sentry, by the way? "The sentry doesn't appear to have stopped you, so I could ask you the same question. Let's just agree that we both have our methods." "Curious, but I feel that there's more going on in Shimmerene than the usual politics and community relations." What else could be going on here? "That's the question, my cautious friend. We have a newly appointed Aldarch and a disgruntled Kinlady, both opposed to the Queen's decree. What's their connection to the missing newcomers?" "I was about to explore the undercroft. Care to join me?" Valsirenn: "A curious pearl. I wonder where the Aldarch acquired it?" Valsirenn: "Probably not important. I'll meet you in the undercroft and we can see what's going on with the newcomers." When you enter the undercroft, it is immediately apparent that something is wrong. Valsirenn: "Something's wrong down here. I sense magic. Vile magic." Valsirenn: "Cages? These people did nothing to deserve such treatment." Valsirenn: "There's someone alive over there. See if you can help her." Speak with the prisoner inside the cage and liberate her. What's a dead Skaafin doing in a monastery devoted to the Eight? "An excellent question, and one I hope to find the answer to. From the evidence before us, it appears this Nord killed the Skaafin before he succumbed to his own wounds. Good for him." "I found this key on the creature's belt, so we can open that door." That's where the prisoner said the monks took the rest of the newcomers. "Then I suggest we pick up the pace. We need to determine what's actually happening down here and who's behind all this." "Without answers to those questions, we won't be able to decide on our best course of action." What about your missing friend? Valsirenn : "I'll explain everything later. For now, we need to hurry." Valsirenn will examine a nearby corpse while you unlock the cage Valsirenn mentioned. Valsirenn : "Is that a … Skaafin?" Valsirenn: "I'll explain everything later. For now, we need to hurry." Enter the Undercroft Great Hall, and you see many newcomers, lined up and bound. Earl of Clavicus Vile: "More newcomers? Unfortunately, the magic only effects those who have been prepared. But never fear. Your turn will come." He then sacrifices the newcomers in the room and uses the pearl downstairs to summon the sea creatures from before. Then the cultist makes his escape. Valsirenn: "I'll deal with the pearl, you hold off these creatures!" Fend off the approaching creatures and speak with Valsirenn. What happened to the pearl? Did you destroy it? "I promised to explain what I know. I suppose that now's as good a time as any." "I'm a member of the Psijic Order. Our Ritemaster sent me to investigate a warning we received about a plot involving Summerset. My inquiries led me here." "The Psijic Order is an ancient magical monastic society. We served as advisors [sic] to the rulers of Tamriel, but that was before we removed our island home from the world. Now this threat has drawn us back." "But why are you involved in all this?" I'm working with Razum-dar, one of the Queen's Eyes. But what happened to the pearl? "An Eye of the Queen? Interesting." 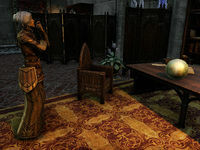 "I diffused the Daedric magic and transported the pearl to Artaeum, the Psijic island, for safekeeping and study so we can learn more about it. But we can discuss this further once we get out of here." Leave the monastery, cutting down the Skaafin that get in your way. Once outside, Valsirenn has a few words for you. Valsirenn: "Living on Artaeum for a few centuries doesn't prepare you for physical activity." Valsirenn: "Let the Eye of the Queen know what we discovered and I'll catch up with you later." The people that were sequestered were killed to power a Daedric ritual. I found this letter. "This isn't the kind of scandal Raz was hoping for. Murder, Daedric rituals, and traitorous behavior have a way of ruining an otherwise perfect day. We need to learn the extent of the Kinlady's involvement. And by we, Raz means you." You want me to go and accuse the Kinlady of conspiring with a Daedric cult? "Accuse? Not exactly. Raz wants you to talk to her. See what she knows about the Aldarch. The Kinlady is meeting with local leaders. Attend that meeting and learn the truth. This invitation and set of elegant clothes will get you through her door." I also met a mage from the Psijic Order in the monastery. "A Psijic? Raz has heard rumors, but there are always rumors about the Psijics. For an island of sages who disappeared more than three hundred years ago, they certainly seem to get around. Did this Psijic mage say what the Order was investigating?" Something about a warning, and she seemed pretty interested in the life-sucking pearl. "There was a life-sucking pearl? You should probably have led with that bit of information! Well, we can worry about the Psijic mage and figure out where these pearls came from later. For now, go see what the Kinlady has to say." Shouldn't you speak to the Kinlady? You do work for the Queen, after all. "Kinlady Avinesse and Raz … do not get along. You see, there was a horse, a platter of pudding tarts, and—no, this one won't bore you with the sordid details. Besides, everyone behaves well when they see Raz. You'll learn more than I would." Head towards the Kinlady's manor. As you approach, a portal opens, and a mysterious Golden Knight appears. Golden Knight: "You there! I have a- damn it! why won't this work?" Lianalah: "Did you see a golden knight?" Put on the disguise and head on inside. Find Galmelon, a Bosmer servant to the Kinlady, upstairs and show him your invitation to the meeting. "The Kinlady is currently engaged. She's holding a conference with Shimmerene's elite to discuss certain... political matters." "Hmm, yes. So you do. And may I say that your outfit is suitably elegant. Please, head into the garden." Now that you've gained access to the meeting, head on inside and listen to Kinlady Avinisse's speech. Kinlady Avinisse: "We all have concerns regarding the Queen's decree. I assure you that I am working with Aldarch Tilcalar to safeguard the sanctity of Shimmerene and all of Summerset." Kinlady Avinisse: "Enjoy the food and drink. Business of the city requires my attention, but I shall rejoin you shortly." Find the Kinlady upstairs in her manor and confront her with news of what's going on in the monastery. She's not too happy to see you here. "No, I refuse to deal with one of the Queen's guests—especially not in my own home! How did you get in here, by the way? No, Never mind that. Since you found your way in, I assume you can find your way back out. Before I call the guards." Why do you oppose the Queen's decree? "Oh, such innocence! You really want to know why I oppose the Queen's order to allow newcomers to enter Summerset? Because I'm trying to protect both the island and the newcomers. It's in everyone's best interest that we maintain a separation." And the Aldarch agrees with your efforts to protect the island and the newcomers? "Aldarch Tilcalar... came highly recommended. He has grand plans for protecting Shimmerene. Grand plans. Unfortunately, in my haste to deal with the Queen's decree, I may have made an error in judgement." "Not that it's any concern of yours, but my chancellor has been unable to verify the Aldarch's existence prior to when we met and I recommended him for the position at the monastery. I assure you, Kinlord Milunthel praised Tilcalar to no end." And were you aware that the Aldarch's monks are killing the newcomers under the monastery? "That's preposterous! Aldarch Tilcalar sequesters the newcomers to ascertain their suitability for life in Summerset. Those who pass will find a place here. As for the rest, they'll be returned to wherever they came from. That's what we agreed to." "The Coral Forest? An odd location for a meeting, but I need to hear the Aldarch's explanation." With the Kinlady dealt with, leave the manor and speak with Razum-dar outside. The Kinlady believes that the newcomers are being sequestered and sent away. "Raz thinks Avinisse is as naive as she is complicit, but she is not a murderer. This new Aldarch, though, has so much blood on his hands it looks like he's wearing red gloves. From what I could discover, he didn't exist before he came to Shimmerene." I overheard that the Kinlady was going to meet the Aldarch in the Coral Forest. "The Coral Forest? A strange meeting place. Raz thinks we should go and see what the Aldarch is up to. After I take back that outfit. I might need it again later. Ah, you have a pretty admirer, my friend. The Psijic sage, yes? Here she comes now." Raz: "The Kinlady is meeting the Aldarch in the Coral Forest. Raz smells something and it isn't moon-sugar biscuits!" Valsirenn: "Your reputation proceeds you [sic], Eye of the Queen. I am Valsirenn of the Psijic Order. And I agree that the Aldarch is more than a simple monk." Raz: "We should work together, yes? But let's travel separately to avoid attracting unwanted attention. Raz will find you both at the Coral Forest." Head to the Coral Forest and meet up with Valsirenn, then begin your search. "We need to find out why the Aldarch asked Kinlady Avinisse to meet him out here." How do we find the Aldarch and the Kinlady? "Based on what we saw in the monastery's undercroft, I'm hesitant to use magic to locate them." "I suppose we'll have to find them through mundane means. Too bad the Queen's spy isn't here yet. I understand he's good at this sort of thing." "Come, nebarra! Let me show you the power bestowed upon me by the Prince of Bargains!" When you find the Kinlady and the Aldarch, you will arrive just in time to hear the tail-end of their argument. Valsirenn: "The Aldarch! We'd better hurry!" Kinlady Avinisse runs away screaming for help. Now's your chance to deal with the Aldarch. Defeat him and smash his abyssal pearl. You can then speak with Valsirenn and tell her what happened. "Razum-dar apprehended the Kinlady. They're at the west edge of the Coral Forest." "What happened to Aldarch Tilcalar? Did he escape?" Aldarch Tilcalar is dead. I heard him mention the Prince of Bargains. "I think we can conclude that Tilcalar wasn't actually an Aldarch. At least, not with his connection to the Prince of Bargains, Clavicus Vile." "Strange magic and creatures worry me, however. Hopefully, the pearl I sent to Artaeum can tell us more." You think you can learn something from the pearl? "You'd be surprised what a particular object can reveal—if you know how to unlock its secrets. " "I need to return and tell Ritemaster Iachesis all that transpired here. If you're willing, I'd like you to come to Artaeum and confirm my story." "The Ritemaster leads the Psijic Order from Ceporah Tower, on the island of Artaeum. This spell attunes you to a portal near Shimmerene, in the ruins of the Keep of Eleven Forces. It always leads to Artaeum, no matter the island's current location." I'll go to Artaeum to talk to the Ritemaster after I check in with Razum-dar. Valsirenn: "One more adjustment and … there! You are now attuned!" Valsirenn: "Find me on Artaeum after you finish with the Eye of the Queen." Now find and speak with Razum-dar, who has been having a chat with the Kinlady. Raz: "Ah, five-claw! The Kinlady and Raz had the most illuminating conversation." The Aldarch called on the Prince of Bargains before I killed him. "The Prince of Bargains? That could only be Clavicus Vile! What Oblivion inspired nest of vipers has Raz stumbled into? This one has a very bad feeling about all this. Where is the Psijic sage? Raz would like to ask her what she thinks." Valsirenn returned to Artaeum. She invited me to come and speak to their Ritemaster. 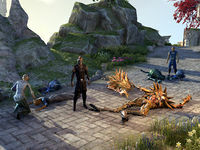 "The Psijic Order's interest in all of this concerns Razum-dar. This one has never had much love of magic or those that practice the art. On the other hand, now Raz has his own person on the inside. An Eye of Raz, if you will, yes?" Valsirenn said the Order would try to find out more about the Aldarch and the abyssal pearls. "Then you must go to Artaeum and discover what the Psijics have learned. When you return, you can tell Raz all about it so he can pass it along to the Queen. Yes, Raz likes this plan. In the meantime, Raz will investigate the Daedric connection." With all of that out of the way, it's time to make your way to the Keep of the Eleven Forces and enter the portal to Artaeum. Once you arrive at the elusive island of the Psijics, head for the Ceporah Tower at the far north end of the map. 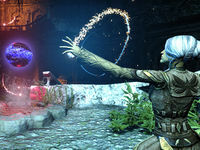 In front of the tower, you'll find Valsirenn, who is in the middle of a conversation. Speak with the Ritemaster to complete the quest. "What a rare honor Valsirenn bestowed upon you. Only a select few not of our order have ever walked upon this sacred island. Val tells me your aid was indispensable in uncovering the false Aldarch's plot on Summerset." We discovered that newcomers to Summerset were being murdered to power the abyssal pearls. "Unfortunate, certainly. The magic you describe sounds familiar, though I can't quite recall where I've heard of it before. I fear the pearls may be a harbinger of the threat Sotha Sil warned us about." Sotha Sil? What threat? I don't understand. "Sotha Sil, one of the living gods of the Dark Elf Tribunal. He's an honorary member of our order. After an attack on his Clockwork City, he warned us about a Daedric threat to Summerset and Artaeum. I sent Valsirenn to investigate." Is there anything more I can do to help? "Indeed, but not until we finish studying the pearl Valsirenn brought us. There are mysteries to unravel and Val believes you will be instrumental to our success. We can get started immediately, unless you want to explore our island first." Valsirenn revealed that she's a mage of the Psijic Order, sent to investigate a threat to Summerset. We were too late to save the newcomers, but we did stop the yaghra and transport the pearl to Artaeum for safekeeping. Now to leave this place. Kinlady Avinisse left her guests and went into her mansion. I should head inside and speak to her. Finishes quest I should talk to the Ritemaster and see what I can do to help.